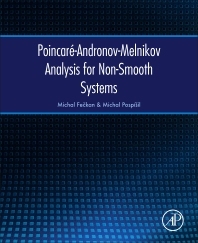 Poincaré-Andronov-Melnikov Analysis for Non-Smooth Systems is devoted to the study of bifurcations of periodic solutions for general n-dimensional discontinuous systems. The authors study these systems under assumptions of transversal intersections with discontinuity-switching boundaries. Furthermore, bifurcations of periodic sliding solutions are studied from sliding periodic solutions of unperturbed discontinuous equations, and bifurcations of forced periodic solutions are also investigated for impact systems from single periodic solutions of unperturbed impact equations. In addition, the book presents studies for weakly coupled discontinuous systems, and also the local asymptotic properties of derived perturbed periodic solutions. The relationship between non-smooth systems and their continuous approximations is investigated as well. Examples of 2-, 3- and 4-dimensional discontinuous ordinary differential equations and impact systems are given to illustrate the theoretical results. The authors use so-called discontinuous Poincaré mapping which maps a point to its position after one period of the periodic solution. This approach is rather technical, but it does produce results for general dimensions of spatial variables and parameters as well as the asymptotical results such as stability, instability, and hyperbolicity. Michal Fečkan is Professor of Mathematics at the Department of Mathematical Analysis and Numerical Mathematics on the Faculty of Mathematics, Physics and Informatics at the Comenius University in Bratislava, Slovak Republic. He obtained his Ph.D. (mathematics) from the Mathematical Institute of Slovak Academy of Sciences in Bratislava, Slovak Republic. He is interested in nonlinear functional analysis, bifurcation theory and dynamical systems with applications to mechanics and vibrations. Michal Pospíšil is senior researcher at the Mathematical Institute of Slovak Academy of Sciences in Bratislava, Slovak Republic. He obtained his Ph.D. (applied mathematics) from the Mathematical Institute of Slovak Academy of Sciences in Bratislava, Slovak Republic. He is interested in discontinuous dynamical systems and delayed differential equations.